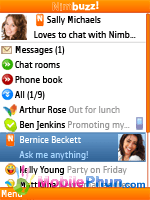 Nimbuzz Mobile is the best free* mobile messenger that lets you call, chat, message, and send files on the go, for free. It combines all your buddies from Skype, MSN/ Windows Live Messenger, Yahoo! Messenger, ICQ, AIM, Google Talk, Gadu-Gadu, Hyves, and more. One login, one contact list, all accounts.